Contemporary sport is shaped by wider society. Today those managing sport must be aware of the broader social and cultural context within which it exists if their effectiveness is to be established and their careers defined. 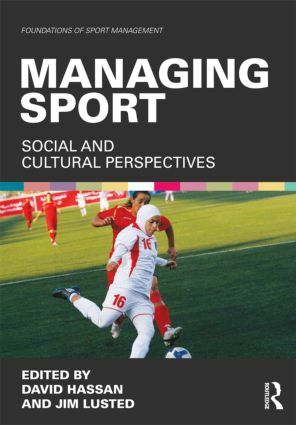 This book is the first of its kind to contextualise the wider social and cultural environment of sport management and explain the key issues and practical implications of this for those working, or intending to find employment, in the field. As part of a comprehensive coverage of these and many other social issues, the reader is reminded of the fundamental requirement to properly appreciate the cultural sensitivities of the managerial environment in which they intend to operate. Each issue is examined from the perspective of the manager or sport practitioner, and each chapter includes a range of useful features, such as case-studies and self-test questions, to encourage the reader to think critically about the role of sport in society and about their own professional practice. This is the first sports management textbook to be based on the thesis that a more socially aware manager is a more effective manager and thus should be regarded as essential reading for all sport management students. David Hassan is Senior Lecturer within the Ulster Sports Academy at the University of Ulster. He is the Academic Editor of Sport in Society, an international peer-reviewed journal published by Taylor and Francis. He is also joint Series Editor of Foundations in Sport Management, a discipline-defining series of books examining this expanding field of study. His research expertise concerns the relationship between sport and national identity, the politics of sport, and sport governance, and he was recognised for his outstanding contribution to research with the award of a Distinguished Research Fellowship from the University of Ulster in 2006. Jim Lusted is Senior Lecturer in the Sociology of Sport at the University of Northampton. He completed a PhD in 2009 in collaboration with the English Football Association, investigating issues around the implementation of their equity policies into the grass roots level of the game. He has published articles relating to race equality policies in local sport in a number of academic journals, including Managing Leisure and Soccer and Society. He is also a licensed tutor for the FA’s Equality Workshop, which he delivers to local football stakeholders across England.